I love stars. Love them. When I was a kid I used to think I wanted to be an astronomer (that was before I found out how much math was required). I grew up in Canberra, so the night sky was pretty visible, and I remember going onto the neighbour’s balcony to look at Halley’s Comet when I was about seven or eight. I was obsessed with Star Wars into my early teens, and I still harbour a secret fantasy about going into space (though after watching Gravity my ardour for that particular endeavour has cooled dramatically). Spacey, planety, starry, galaxy-themed clothing and accessories get me every time. 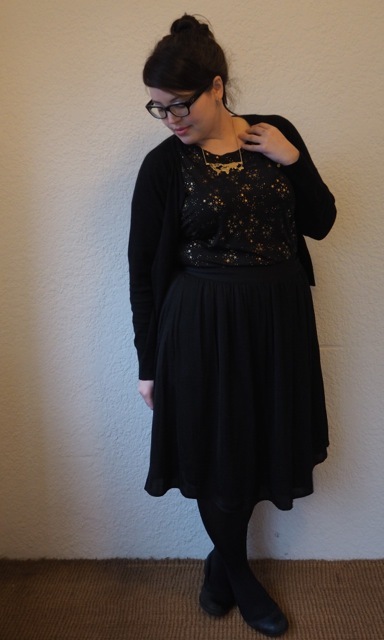 Stars and hearts: my two favourite motifs. I was on Yesstyle recently, ordering up some more of my favourite BB-cream and thought I’d have a bit of a peruse around the rest of the site so I wasn’t “wasting” the free shipping. The “plus-size” line is pretty hilarious (most of what they consider to be plus-size would be lucky to fit a size 14 in Australia) but each clothing item has the real measurements listed, which means that you can usually take a safe punt on what will or won’t fit you. And most things are so cheap it’s worth giving it a whirl, anyway. 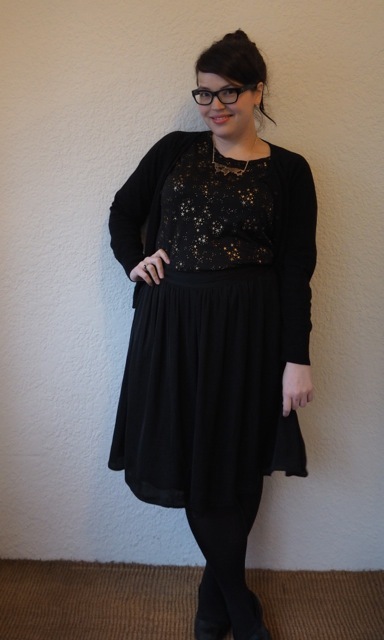 This black and gold starry print tee is also available in white, and is theoretically “one-size-fits-all”. At 46″ around the bust it’s fitted on my f-cups, and oversized on the teensy little model pictured. I’m not fussed though, I love the scattered star print, and the $28 price tag made it hard to say “no” to. The fabric’s a stretchy, woven polyester that has enough drape and stretch to work over a wide variety of shapes and sizes. The wide neckline and dropped-shoulder-sleeves give it enough volume to work easily on my fuller-figure. It’s better quality than what I would have expected for the price (under $30! 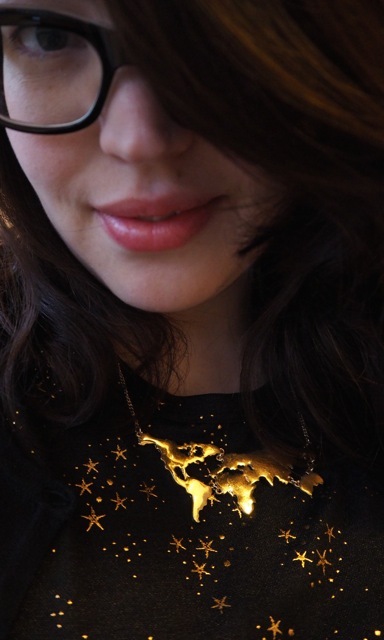 ), the gold-foil stars have a lovely spangly shimmer to them, and while the fabric doesn’t even pretend to be anything but 100% polyester, it’s a soft, wearable, utterly un-crushable tee that should be easy to dress up or down according to what it’s paired with. 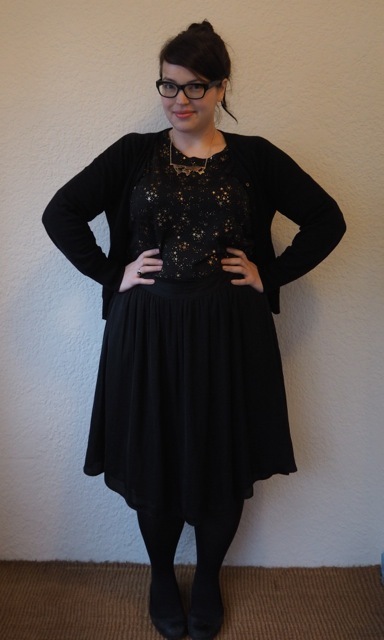 I wanted to wear it to work, so I teamed it with tights, a skirt, a cardigan, and then – because I couldn’t resist – my shiny gold “There’s a Map For That” necklace from Modcloth. It goes so nicely – the earth, suspended again the background of starry heavens – don’t you agree? 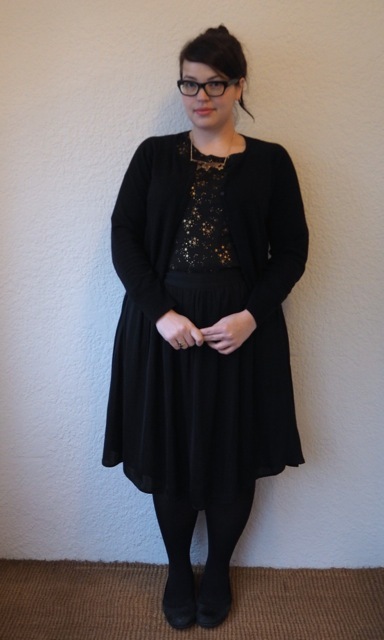 This entry was posted in Uncategorized and tagged cold, modcloth, skirt, sonsee, target, yesstyle by lillipilli. Bookmark the permalink. Oooooh, STARS!! And gold sparkly stars at that! I love stars too, and this would look smashing with a pair of jeans. Love the gold necklace against it, looks so shimmery! By the way, that last shot, the up close of the necklace, is breathtaking. The way yr hair swoops down, the golds, everything. Just beautiful! Looks gorgeous with the necklace! That’s a really cool top. My kid is a mad astronomy fan, so I spend a lot of time toting him to observatories. It’s surprisingly peaceful stargazing though.